Below a sentence is provided with two phrases being Coloured Red. You need to find out those phrases in the sentence are grammatically correct. If they are correct mark option V i.e. No correction required, or if they are incorrect then choose the best option which replaces those phrases in the sentence and makes it grammatically and contextually correct. “ranging to” face-scanning smartphones and conversational coffee-table gadgets to computerized health care and autonomous vehicles. Solution: III The preposition “For” is used as to indicate purpose whereas of is used for giving the reference and over is used to represent the extended periods of time where it will be correct with decades. The Xiamen summit follows a gruelling two and a half months during “which the rhetoric between” India and China — especially the latter’s — “had been quite sharp”. Solution: IV among is wrong as it is talking about two countries which eliminates option III. Use of whom is also incorrect which eliminates I. According to tense rules we use III form of verb with has so been will be used ehich eliminates option II and had is incorrect because the sentence is in present tense as in the beginning of the sentence it uses “follows”. Below a sentence is provided with two phrases being Coloured Red. You need to find out those phrases in the sentence are grammatically correct. If they are correct mark option V i.e No correction required, or if they are incorrect then choose the best option which replaces those phrases in the sentence and makes it grammatically and contextually correct. “Questions had therefore raised” about the possibility of EVM-tampering either by the introduction of malicious code (trojans) that could override the logic embedded in the chip, “replacing its chip, and manipulating the communication” between the ballot and the control units through remote signals or equipment. Solution: III as the sentence is in passive voice have been will be correct which makes only option III the correct choice. A section of an article is given with a sentence being compressed. You need to comprehend the paragraph and find out the suitable sentence, from the provided options, which fulfill the blank grammatically and contextually correct. Experts are also seeing a shift in the strategy of hackers, who are now targeting mobile devices in order to obtain sensitive information that is stored on them. Israeli cybersecurity firm Checkpoint said that its security researchers have revealed a new variant of Android malware, breaching the security of more than one million Google accounts. The new malware campaign, named Gooligan, roots Android devices and steals email addresses and authentication tokens stored on them. (___________________________________________________________)“This theft of over a million Google account details is very alarming and represents the next stage of cyber- attacks,” said Michael Shaulov, Check Point’s head of mobile products in a statement. Check Point’s Mobile Research Team first encountered Gooligan’s code in the malicious SnapPea app last year. In August 2016, the malware reappeared with a new variant and has since infected at least 13,000 devices per day. About 40 per cent of these devices are located in Asia and about 12 per cent are in Europe. I- The infection begins when a user downloads and installs a Gooligan-infected app on a vulnerable Android device, or by clicking on malicious links in phishing attack text messages. II- With this information, attackers can access users’ sensitive data from Gmail, Google Photos, Google Docs, Google Play and Google Drive, according to Check Point. IV- As the digital economy grows, consumers should be aware of the risks that accompany the convenience. V- The company said that in this phishing attack, victims are asked to enter their account number, mobile number, email address, one-time password and other details. Solution: I as the sentence before blank is talking about the gooligan app which is continued by giving detail in option I. Option III is incorrect as it is talking about the website Option Iv is talking about digital economy which is irrelevant. Option V is repetitive which cannot be used. Option II is talking about the information stole from the accounts which cannot be used as continued sentence. That India’s economic momentum has slowed down is now beyond doubt. Advance GDP estimates and gross value added (GVA) for the current fiscal year from the Central Statistics Office clearly reveals the extent of the slowdown. While GDP growth is now pegged at 7.1 per cent, compared with a 7.6 per cent pace in 2015-16, GVA is forecast to expand at 7 per cent this year, easing from the 7.2 per cent posted 12 months earlier. (________________________________________________________________). A closer look at the sectoral GVA projections throws into relief the areas of concern: Mining and quarrying is estimated to shrink 1.8 per cent this year after expanding 7.4 per cent a year earlier, while electricity, gas, water supply and other utility services — collectively an indicator of broader economic activity — is slowing to 6.5 per cent from 6.6 per cent. More worryingly, the seven-month numbers establish that two key engines of the economy, manufacturing and services, are losing momentum faster than was anticipated, and this could spell trouble for the coming quarters. I- This is especially so when seen in the backdrop of demonetisation and what the Reserve Bank of India referred to as the “short-run disruptions in economic activity in cash-intensive sectors such as retail trade, hotels & restaurants and transportation, and in the unorganised sector” and “aggregate demand compression associated with adverse wealth effects”. II- Preliminary reports from the States show the total area sown under the rabi crop as on January 6 stood at 602.75 lakh ha, up 6.5 per cent from last year. III- Nonetheless, in the Union budget due next month, the Centre will have to work in a substantial fiscal fillip to help rekindle economic momentum. IV- Finance Minister Arun Jaitley in April projected that growth could accelerate this year to 8 per cent to 8.5 per cent subject to a ‘normal’ monsoon. V- And as the Chief Statistician emphasised, these projections were based solely on data from the first seven months through October and do not factor in the impact from the withdrawal of high-value banknotes and the consequent cash crunch. Solution: V As only V option continues with the projections which are given before the blank. Below some sentences are given in A, B and C with one Idiom in each as bold. 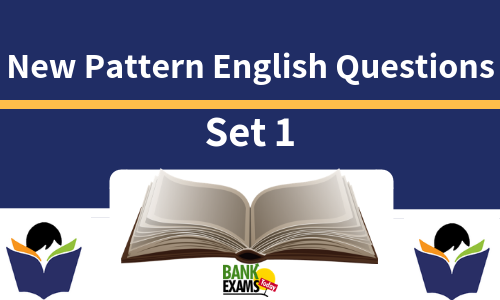 You have to identify the sentence in which the given idiom is used correctly as per the context and mark the answer accordingly. A) A partnership between the Foundation and Microsoft allows visitors here a virtual reality showing, through headsets, of Darie's public sculptures still on view in Havana, having survived “through thick and thin”, a tribute to the artist's belief in taking art to the people. B) The proposal of the Indian government to issue orange-coloured passport jackets to its citizens who have not completed high school education and hence require emigration clearance to be employed overseas is not only a “bolt from the blue”, but it also seems like a perplexing policy decision that begs clarification. C) will the prime minister and his officials take the necessary time to dissect what went wrong and try to ensure that sort of thing doesn't happen again, or will they simply hope that the disorder in other federal parties continues and that Trudeau's personal style is enough to "weather the storm"? Solution: V through thick and thin- under all circumstances. Bolt from the blue - something important or unusual that happens suddenly or unexpectedly. Weather the storm- to deal with a difficult situation without being harmed or damaged too much. A) Social workers and doctors are “at loggerheads” over how well the new system will work. Trevor and his ex-wife Becky ended up at loggerheads — this time having a shouting match on the doorstep. B) At that time, the two nations were “at loggerheads” over the Syrian conflict, with Moscow siding with Damascus, while Ankara stood solidly behind the Syrian revolution. C) Fashion stylists in Nigeria are now probably “at loggerheads” as they are everywhere. However, among the lot, there's hardly anyone who could forward as a true professional. Solution: IV at loggerheads means in conflict only sentences A and B are talking in this context so option IV is correct. A) That event is called the “Great Dying” because it was the most devastating mass extinction ever, resulting in some 95 per cent of all species “tossing up”. B) Many party members and observers consider the contest for party leadership a “kick the bucket”, with the winner almost certainly in line to become the next president because of the ANC’s large majority in Parliament. C) Winter is “on the wane” and the smell of spring speaks of new hope, fresh makeovers once again. After a winter of de-monetisation, a resilient nation wakes up again to embrace the oncoming spring, getting ready to celebrate the most colourful and joyous of all festivals, Holi. Kick the bucket is the informal way of saying death so it is also contextually incorrect because the sentence is saying about the contest in the party members. On the wane means the declination in power which is correctly used in sentence C as it is saying spring season is emerging while winter is on the wane.